There are a whole host of reasons to like the PC Engine version of Taito's Mizubaku Daibouken (known as Liquid Kids outside of Japan). One of them is that its gameplay, graphics and music are remarkably close to those that appear in the arcade original, released in 1990. Another is that its instruction manual is really cool. The only bummer associated with Mizubaku Daibouken's manual: The front and back covers (below) are the only ones that appear in color. The rest are in black and white. (Well, and a bit of gray.) 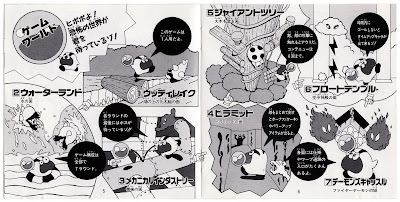 I don't consider that to be a huge negative, though; on the contrary, all of the illustrations that appear in the Mizubaku Daibouken manual are so nice that after a bit you basically forget about the lack of color. 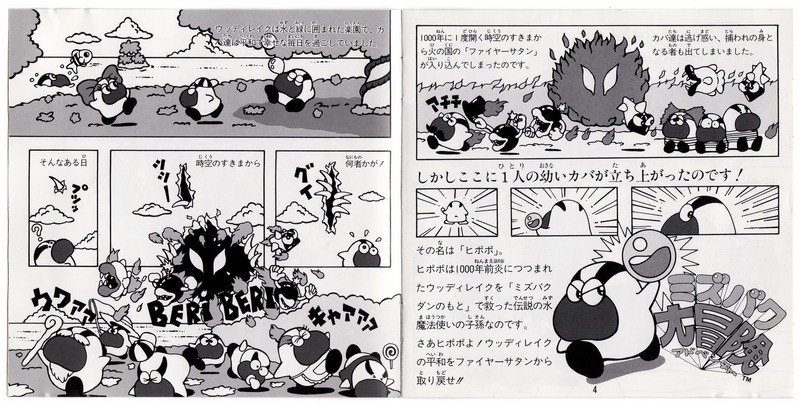 Anyway, the manual gets off to a rollicking start thanks to a two-page comic that seems to tell the game's backstory. Yes, Mizubaku Daibouken's manual eventually answers the all-important question: How in the hell do I play this thing? Even then, though, it does so using cute little illustrations. Excuse the interruption, but I just have to say that I love that this game features a pig power-up (upper-right corner of the scan below). Actually, it's not really a power-up--as far as I can remember, you just get points for touching it--but you know what I mean. Yep, more illustrations and more power-ups on the next two pages. Note that Mizubaku Daibouken features cake. Everything is better with a slice of cake, isn't it? 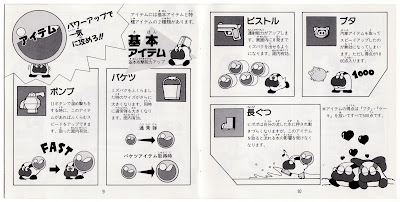 Unfortunately, like pretty much everything in life, Mizubaku Daibouken's manual eventually comes to an end. Not before shining a spotlight on a few of its enemies, though. 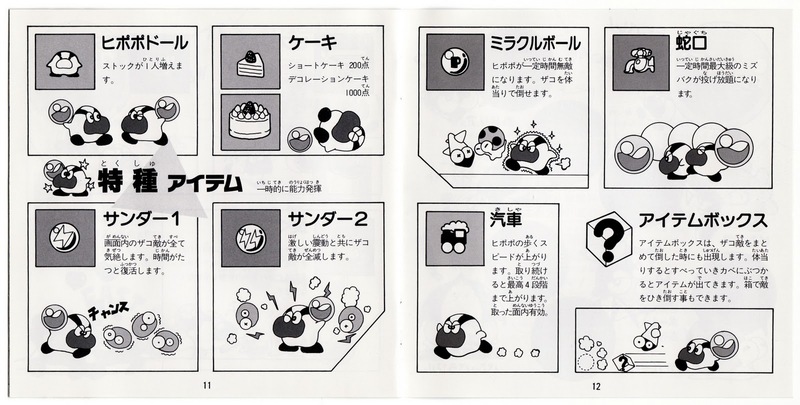 I find it kind of strange that the manual's designers didn't use the space to highlight the game's bosses, but maybe they were trying to keep them a surprise? Oh, and in case you're wondering: Yes, the little character with the parasol pulled down over his/her/its face (lower-right corner) is the coolest in the game. Without question. This makes me miss the old manuals...the Super Mario 3D Land instruction manual is a friggin fold-out poster...LAME! Way lame. Yeah, manuals like this one seem to be museum pieces nowadays, don't they, Justin? As for Super Mario 3D Land's manual being a fold-out poster: That gets a :( from me. This makes me remember why these manuals were so fun. While we tended for the most part to get bland descriptions and non-inspiring artwork (or lack thereof) those in japan made sure to make even the manual something to hang on to just because the presentation tended to be quite memorable. I remember how the japanese manual of the story of thor had a couple of four strip comic pages (think azumanga daio style) comically explaining the special spirits the protagonist would get during the game and the one for PS3 that did some funny pictures for explaining certain things like buying new equipment had the cast quite happy...except the main character since afterwards he had quite an empty looking wallet. Totally awesome manual scans! I can't wait for the next one! Well done! Hey there, Motherplayer. It's funny how much instruction manuals differed from region to region back in the day, isn't it? Some North American (and I'm guessing Australian and European, too) manuals were great, of course, but the majority paled in comparison to their Japanese counterparts. 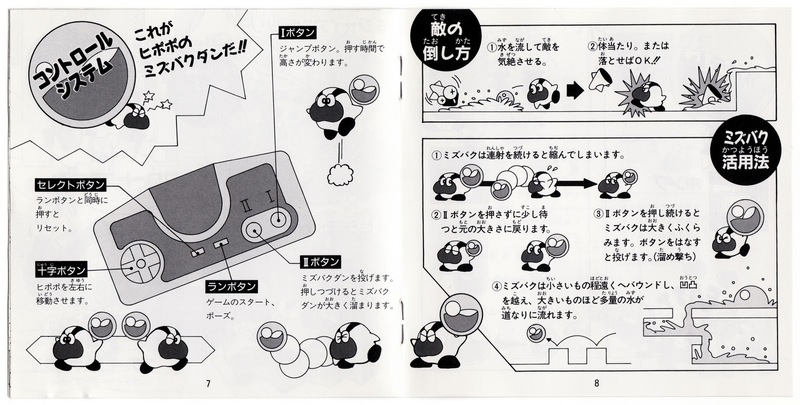 That's not to say all of Japan's instruction manuals were top-notch back in the day, of course. In fact, my second post today is going to touch on that fact (that a lot of Japanese manuals were bad/boring, too). At least they got their fair share of winners, like the one featured in this post, though, right? That is quite true. From my end, I've noticed more of the lackluster Japanese manuals have usually been the movie based ones. The ones for the Megadive "Batman" and "Judge Dredd" were the best examples for me since all they really had were descriptions and a few pictures from the actual films. That was pretty much as interesting (or uninteresting) as it got. Ah, yes, I can see how that would be the case, Motherplayer. I don't have any movie-based games -- that I can think of, at least -- at the moment, but I'd guess most of their manuals, even for the Japanese versions, would be the definition of ho-hum. 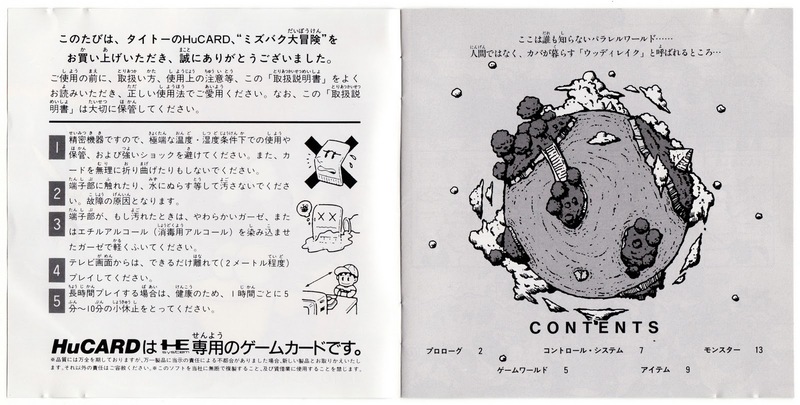 Surprisingly, a lot of the early Famicom games seem to have lackluster manuals, too -- even published by Nintendo. 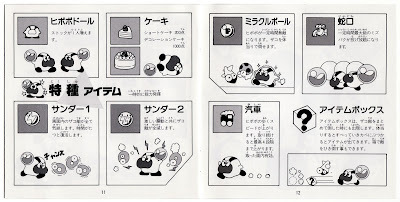 In fact, of all of the Nintendo-published Famicom games currently in my collection, all of them have boring manuals except for Mother and Super Mario Bros. (and the latter's manual is *just* this side of boring, IMO). Actually if you want to see those manuals yourself, theres a site that has rips of plenty of Japanese megadrive and 32X manuals. Thats how I found them myself. Just ask if you wish to have the link. And no surprise there. I imagine that kind of mediocrity was helped by the fact that it was before the makers realized they could be a little more fancy with their work. Thankfully it managed to click better later on. Yes, Motherplayer, I'd love it if you'd share that link when you have a moment! 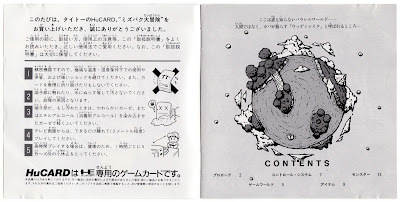 As for early Famicom game manuals being boring: I agree that it isn't *too* surprising. I'm actually looking forward to seeing first-hand when Nintendo realized they could/should be more creative, BTW. 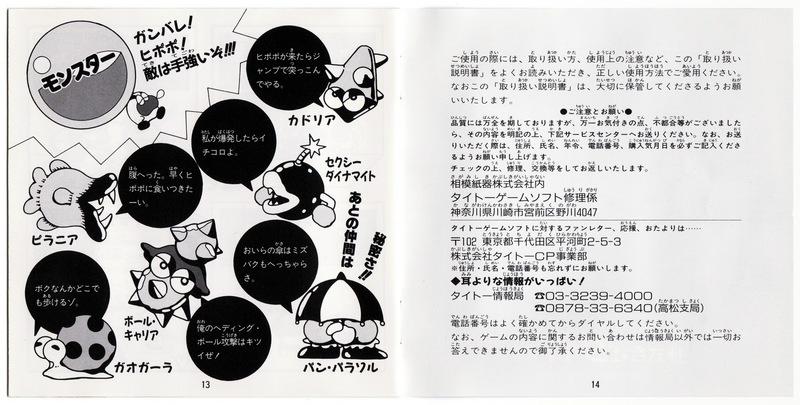 As far as I can tell, all of the manuals produced for the company's Pulse Line and even "Silver Box" Famicom games are pretty darn boring, although things seem to look up starting with Super Mario Bros. Unfortunately, the only Nintendo-made, non-Pulse Line/non-Silver Box Famicom game I own at the moment, other than SMB, is Mother, so I can't say with any certainty that Nintendo's game manuals went from boring to interesting starting with SMB. This makes me so nostalgic for god instruction manuals. Picking up the new Metal Gear HD collection just reminds me how dismal they are now with bare-bones basic information and no excitement. I still have tons of instruction manuals from the 8-bit and 16-bit era from when I bought the games just because they were a little piece of entertainment on the side. Thanks for the scans! Made my day! I agree with you, BTW, that modern manuals can't really compete with these old ones. Even modern examples that aren't terrible (see those produced by Nintendo and Square, for instance) just aren't as whimsical or fun as those that were made for the 8-bit and 16-bit systems, IMO. There's your link. Feel free to read them at your leisure. As a suggestion, I'd reccomend you check out the manual for "The Ooze" first since it makes absolutely no sense how a Bunny Girl and almost naked and buff construction man connect to a game about a man turned to ooze and looking for revenge. 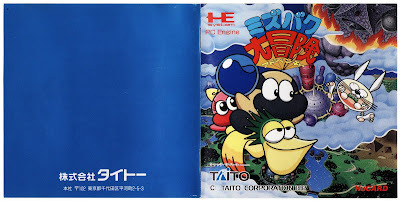 I'd have to call it the most unique out of the whole Japanese Megadrive Library. Yep, I'm gay. And I like video games. Old Japanese games and systems are my favorites--the Famicom, PC Engine, original PlayStation and GameBoy, especially--but I like plenty of newer ones, too. If you have similar interests and you don't mind perusing a blog that's got the word gay in its name and is practically slathered in pink, you'll probably enjoy your time here. I'm also on Facebook, Flickr, Google+, Instagram, Tumblr and Twitter, by the way. Oh, and my Switch Friend Code = SW-5852-5514-6897. A dungeon-crawling, turn-based, X-rated RPG aimed at gay guys, you say? Put me down for a dozen (or more) copies! Which games are you playing this weekend? What's on your holiday wish list? Mario + Matryoshka = Marioshka!